This has been an interesting year for Stern so far and the news today will only build on that. 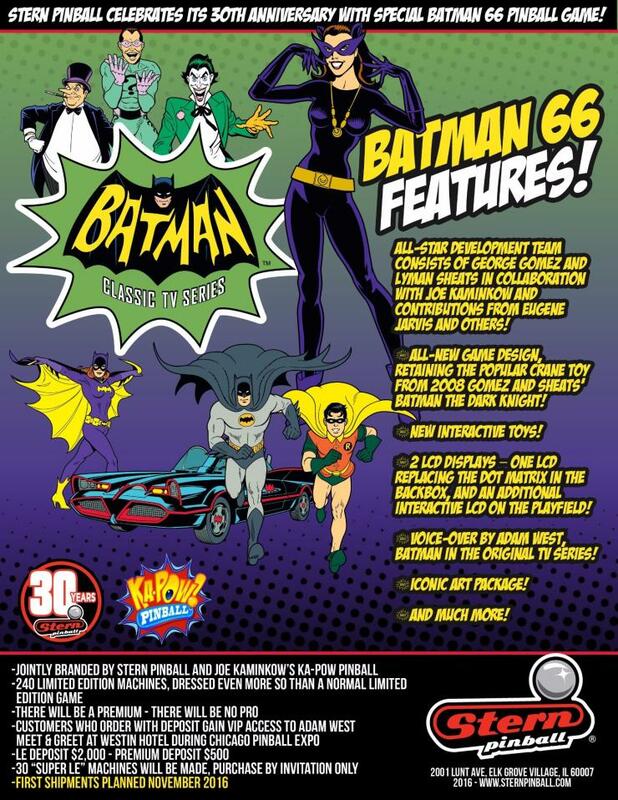 A flyer has been shared from a pinball distributor that explains exactly why Adam West is showing up to the Stern 30th Anniversary pinball bash – because he is also providing voice overs for their newest machine, Batman 66. UPDATE: I reached out to Raw Thrills CEO Eugene Jarvis to find out what his involvement is in this game and he got back to me today. About Batman 66 – I’ve been a huge fan since i was a kid – Adam West is the original Batman and always will be! When Joe Kaminkow was hatching the concept for Batman 66 awhile back I jumped at the chance to get involved in some way. Unfortunately my programming chops are pretty rusty after a what seems a millennium out of pinball, so I’m helping with the video (this will be Stern’s first LCD game!) and doing some super villian audio tracks! George Gomez and Lyman Sheats are truly the dream team when it comes to making a legendary pin, and they are killing it with Batman 66! Thanks to Eugene for taking the time to answer those questions! We will see Batman 66 in action next month at the Stern 30th Birthday bash. #1: George Gomez and Lyman Sheats have impressive resumes for pinball, click on their names to show the lists of games they are credited on. But I notice that Raw Thrills CEO Eugene Jarvis is listed there. He got his start by programming Atari pinball machines but is also credited on a few Williams pinball tables. I reached out to Mr. Jarvis for comment and will update this post as I find out what his contribution is to this title. #2 – This is a new design that includes the crane toy from the 2008 Batman pinball machine. The image of the game itself has not been unveiled yet. #3 – Rumors that Stern was going to switch over to LCD have been going on since a redesigned backbox was introduced for Star Trek (2013) but after Ghostbusters, the talk at trade shows and online was that the next game would “definitely” include a color LCD system. #4 – The setup for the editions is a little odd. There will not be a Pro – likely the cost of the LCDs make that not work out. There will be a Premium, an LE that is “dressed” up with more stuff than a typical LE and then a Super LE edition that are purchased by invitation only. Stern is also going to take deposits for this which is the first time that I am aware of them doing this. #5 – Begins shipping November 2016. We can only speculate as to whether or not Stern will have a “normal” license out between now and the end of the year since this is being handled differently (not completely unlike the Spider-Man Vault Edition). What are your thoughts on this new upcoming release from Stern? Whoa! This is so cool. I love the artwork, very retro and kid friendly. If they get back to a TSPP, POTC and LOTR level of quality it should be a good seller. Most of what they’ve created in the last 5-10 years has been cr*p.